If you wonder what I mean when I say “we put a survival ring around a tree,” this might help explain the process. First you need a tree with ivy on it. And here it is! 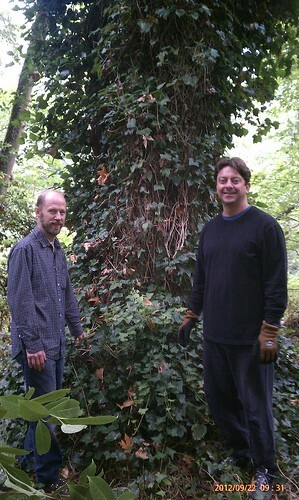 Tad and Chris stand in front of the tree we’re about to work on. 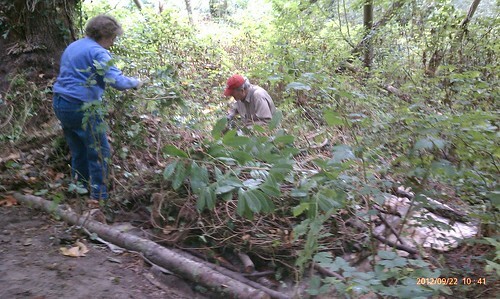 Before we pull the ivy off the tree, we build a platform to dry out the ivy and let it rot in place. In a few years, it becomes humus. 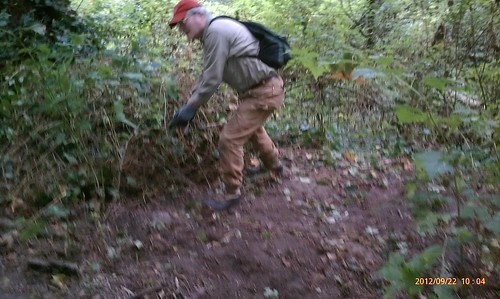 Here’s a blurry an action shot of Morry clearing the ground. It’s frequently the case that you have to pull up ivy to clear the spot for the platform. First we put down a layer of burlap, to prevent shoots reaching up into the platform. Then long, thick logs (in this case, more than six feet long, and a couple inches in diameter) to form a square. More thick logs are laid out between the square, then a grid is formed by placing thinner logs across the bottom layer. The more separation between ground and platform the better. Then you can put the ivy on the platform. Morrie and Ellie put ivy on the platform. You can see some burlap just above the date stamp, and a framing log towards the middle foreground. The ivy is cut at shoulder height. The ivy above the cut is left in place to die, and the ivy below the cut is pulled away from the tree. This sometimes takes a great deal of effort. Ivy roots can reach several inches in diameter, and roots growing close together will fuse into a solid mat. A crowbar is one of the most useful tools for this kind of work. Tad is holding a root that’s about 2″ in diameter. Also, you can see that we’re working on a slope with this tree. 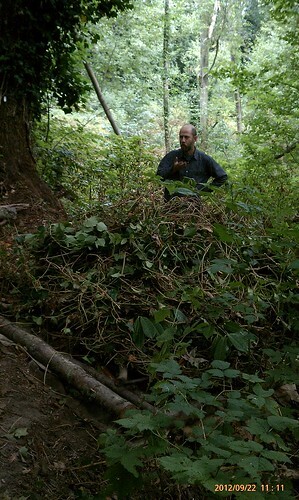 Here’s the final ivy pile, with Tad standing behind it to give a sense of scale. He’s about 5’6″ tall. It was taken from pretty much the same position as the “before” picture. The ivy above the cut will die, but it might take awhile. Even so, it will stop growing up the tree. 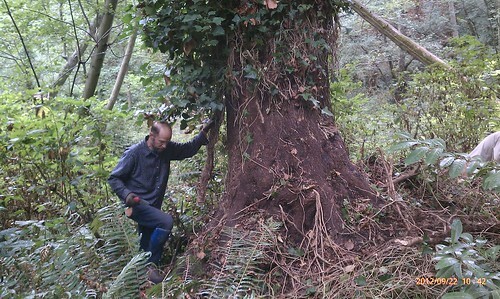 This tree was more than 35″ in diameter, and was about 100′ tall. 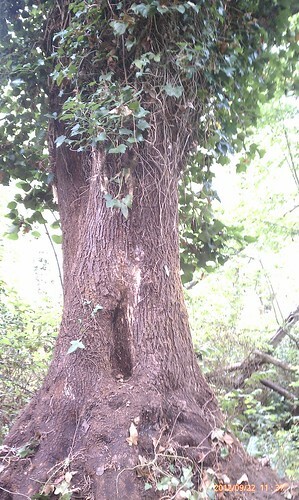 The complete circumference was covered by ivy to about 70′.